Home>Sports> Steph Curry On Botched Dunk Attempt: "The Lord Wouldn't Let Me Do It"
Steph Curry had the open court ahead of him and dreams of a dunk contest worthy dunk dancing in his head during the third quarter of Golden State's blowout victory against the Lakers. Unfortunately, he slipped and fell on his back. And then compounded his error by jacking up an airball from the corner. Following the Warriors 130-111 win, in which Curry posted a pedestrian 11 points to go along with 12 assists and five rebounds, he spoke candidly about the hilarious fast break folly and chalked it all up to The Lord's will. 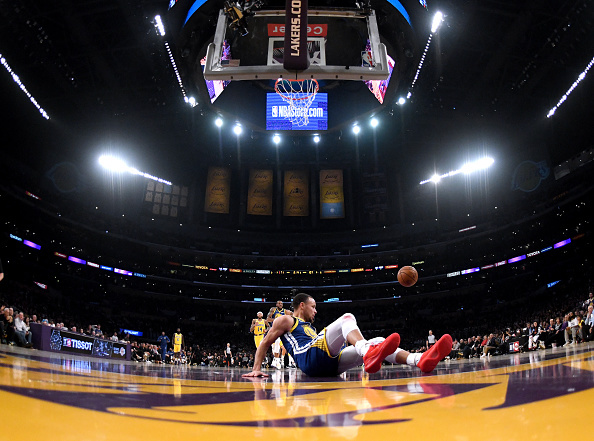 Curry didn't expand on what type of dunk he had envisioned before he was flat on his back staring up at the ceiling of Staples Center, but it sure looks like he was twisting his body for a 360. We may find out if he gets another wide open breakaway, but until then we'll just have to use our imagination. DeMarcus Cousins Says Him And Anthony Davis "Could've Been Something Great"
SPORTS Steph Curry On Botched Dunk Attempt: "The Lord Wouldn't Let Me Do It"